Are you an adventurer at heart? What would you think of packing up your life for three months next year to live and work for a full month in each of three great cities? It's like the semester abroad you enjoyed in college ... but with definitely more of a luxury touch! The best part of any immersion is the chance to get to know a city deeply. You'll have your own luxury apartment near the Plaza San Martin in Buenos Aires, the Punta Carretas neighborhood in Montevideo, and the Providencia community of Santiago. You'll be totally free to explore the neighborhood; get to know its sights and sounds; and experience its restaurants, coffee houses, and night life. The package also includes office space with WiFi, available to you 24/7. You'll be able to telecommute from South America, working with your clients by phone and email (and they'll never know you're a continent away). The weekends feature hosted excursions so that you can get to know the culture and history of each city and the surrounding country. 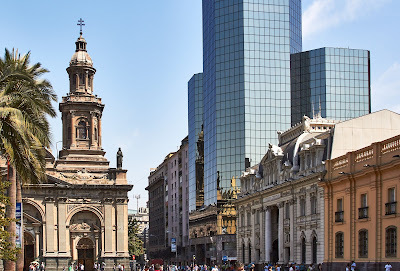 Click for what you can look forward to in Buenos Aires, Montevideo, and Santiago. Here's what's included in your three month sojourn. International flights to the starting destination and home from the ending destination are excluded, as are meals and spa days. Are you intrigued? Check it out here — and when you're ready to take the plunge, you can apply here.